The Embroidery Department at TheFireStore is proud to announce the launch of another awesome product...our 3D "FIRE" Customizable Embroidered Hats! click to build your own! The new, special 3D FIRE wording can be accompanied by your personalization---Fire Department or City name, whatever the case may be! Order them for just yourself, as a gift, or for an entire department--they are sure to be a hit! 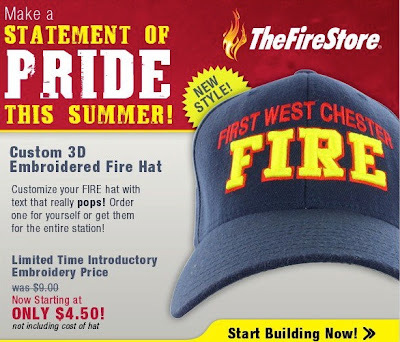 For a limited time, they're starting at $4.50 for customization (not including the cost of hat), which is half price! Stock up now and check out our customizing site to get started! Still like the Insert Style hats we designed? You can get them here, too! Heck, grab one of each! Either way, you'll make a summer statement of pride this summer with one of our custom hats. So get started designing yours today.